There are times when you want to take your music with you, but you may not want to bring along your phone—like when going for a jog. 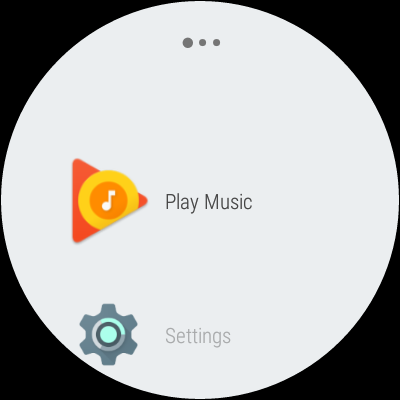 The good news is that you can transfer music to an Android Wear watch and leave the phone at home. Before we get into how to do this, however, it’s worth noting that this only works with Google Play Music—if you use something else (especially another streaming service) for your tunes, then you’re probably out of luck. 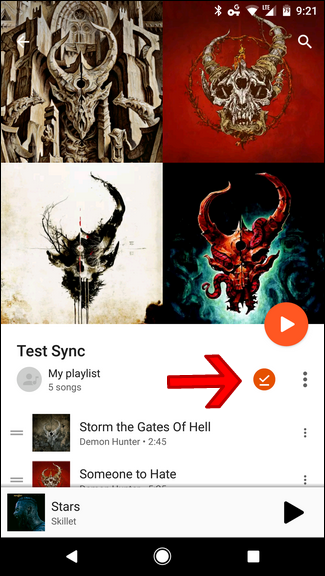 It’s also worth pointing out that this feature is only available for music you’ve purchased or music you’ve uploaded to your Google Play Library. 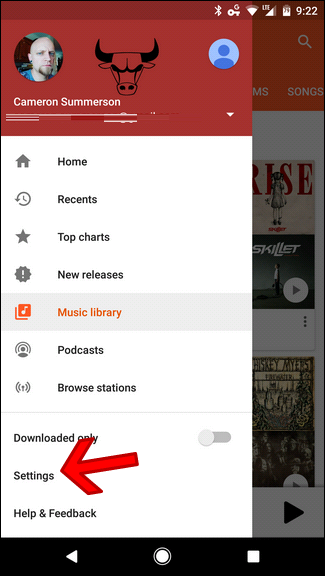 Otherwise, you’ll need a subscription to Google Play Music All Access, which will allow you to download playlists and albums for offline playback. If you’ve met all that criteria, you’re ready to go. 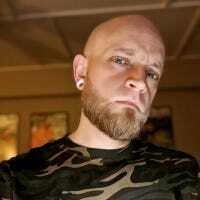 This journey starts with in Google Play Music, so travel there with me, if you will. Once in the app, slide up the left-hand menu, then scroll down to Settings. From there, scroll down a good ways, till you see the “Android Wear” section. 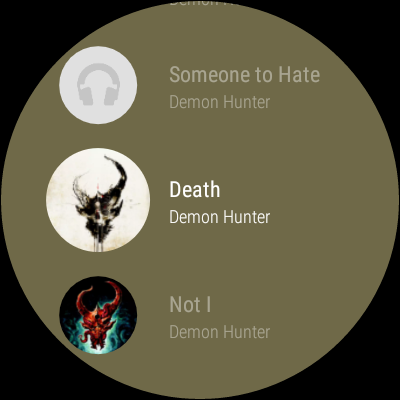 Tap the first toggle—Download to Android Wear—to allow music to be transferred to your watch. 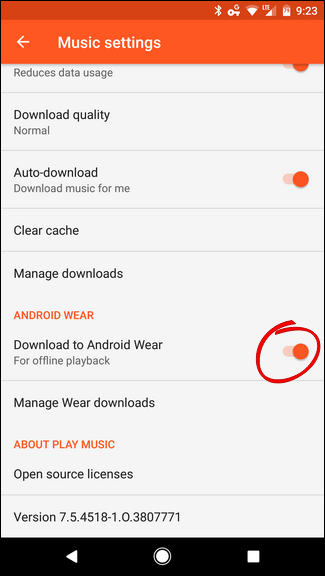 If the music you’re trying to get on your watch is already stored on your phone (for local playback), you can tap the Manage Wear Downloads option to start transferring music immediately. Locally-stored content will show up under the “Device Storage” section, and you need only tap the gray watch icon on the right side to start the transfer. Easy peasy. 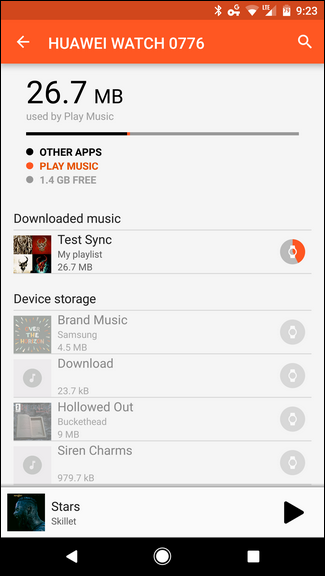 If your music isn’t already stored locally, you’ll want to get your playlists (or full albums) ready for transfer. 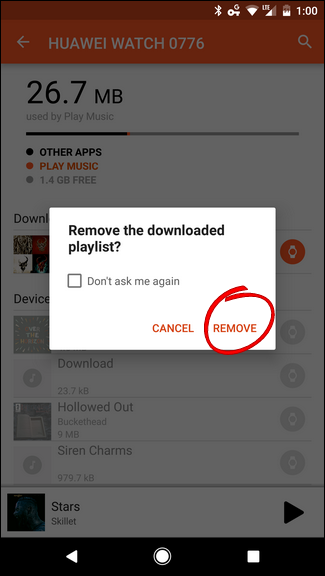 Remember: this option requires a paid subscription to Google Play Music All Access. First, navigate to the playlist or album you’d like to save—for playlists, head to Music Library (in the slide-out menu on the left), then Playlists. For albums, well, just find the album you’d like to save. Easy enough. 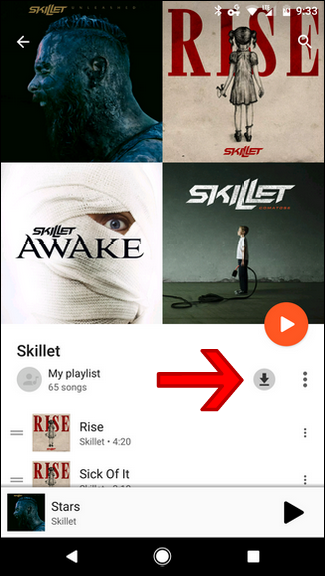 Once you’ve found the playlist or album you’d like to save, tap the grayed-out down arrow to the right of playlist or album name. It’ll start to fill in orange, and will be completely full once the download is complete. From there, you don’t have to do anything else—since you told Music to transfer your offline files to Android Wear, it will automatically send the newly-download playlist or album to your watch. To check that progress, you can jump back into Settings > Manage Wear Downloads. Again, the gray watch icon will slowly turn orange as the files transfer over. Once it’s done, the watch icon will be completely orange. If you’d like to remove the download from the watch, just tap the orange icon and tap “Remove”in the dialog box. Okay, now that all the music on on your watch and ready to you, you’ll want to give it a listen, right? That part is easy. Now, if your watch has a speaker, you can play the music directly through that…though I’m not sure why you’d want to (seriously, those speakers are tiny). Instead, you’ll want to pair a Bluetooth headset to your watch. 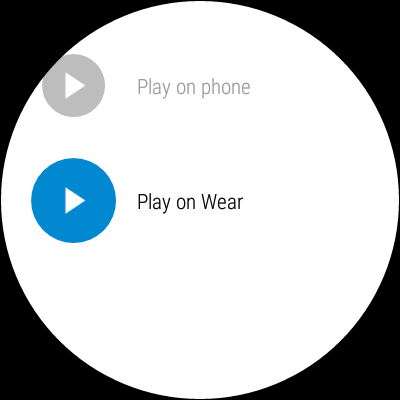 With your headset paired and connected, slide in from the right side of your watch’s face to open the app tray. Then scroll down until you see the Play Music app. Tap it. 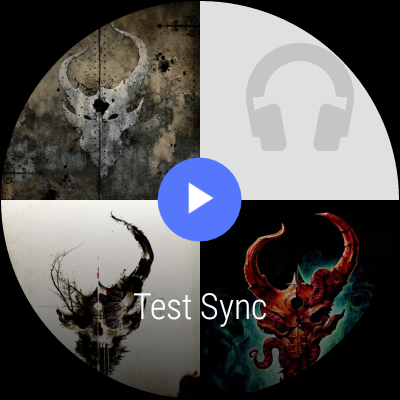 When you first open the app, it’ll ask if you want to play music on your phone or on Wear. Choose the latter. 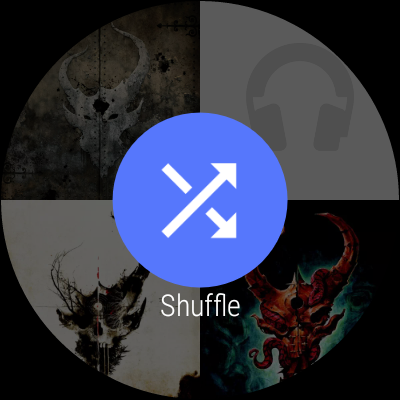 At this point, it’s all pretty straightforward: you can choose a playlist or album, shuffle all content on the watch, or select individual songs. It’s all up to you. That’s the power of choice, baby: any way you want it…well, as long as it’s through Google Play Music. It’s worth mentioning that the majority of Android Wear watches only have 4GB of storage, and a bit of that is take up by the OS and installed apps. So, at any point, you may only have a couple of gigabytes to store your music on. It’s like we’ve come full circle here, back to the days of 2GB iPods. Pick and choose your music carefully, guys.